The Seahawks have fired Jim Mora as coach, his coaching staff has been informed. The news was first reported by FOX Sports. 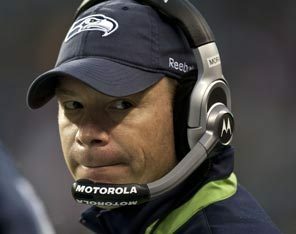 Mora coached Seattle for one season, finishing 5-11. His firing comes at a time when the Seahawks are still looking for a president. Mora, 48, considers Seattle his home. It’s where he went to high school and attended college, and he returned to work for the Seahawks as an assistant coach after he was fired in Atlanta following the 2007 season. He served as Seattle’s secondary coach for one season and in 2008 was designated Seattle’s successor to Mike Holmgren when it was announced Holmgren would coach one more season, fulfill his contract and leave the organization. He becomes the shortest tenured head coach in Seahawks history. Mike McCormack coached seven games in 1982, but he was a replacement for Jack Patera, who coached only two games that season. Mora’s firing has at least as much to do with the change of team President as it does with the lack of success on the field. One year isn’t much time to really rebuild a football team.